This dolls price guide presents modern Barbie dolls produced from 1973 through today. For each doll, photographs, dates of production, market prices and other information will be provided. All prices and values given are based on a combination of dealer and Internet ​pricing, and are based on dolls NRFB (never removed from box). Prices for dolls removed from box are approximately 40% lower. You may browse the price guide using photographs or the text index. For earlier dolls, please see the Vintage Barbie Dolls Price Guide. Many collectors cite the 35th Anniversary Barbie doll as the doll that almost single-handedly created the Barbie doll collecting craze in the mid 1990s. Released when many of the children who had the original Ponytail Barbie doll (which this doll is a reproduction of) reached the prime collecting years of middle age, she was the perfect doll to bring many of those women into the hobby of Barbie doll collecting. At the time of release, the brunette version of the doll was rumoured to be rarer, but both the blonde and brunette versions of the doll bring the same price on the secondary market today. The earliest release of this doll had curved eyebrows instead of arched eyebrows, which is incorrect and which was corrected in subsequent releases. the cured brow doll is rarer. This is the most popular of several baseball themed Barbie dolls released in 1999; other versions include the Chicago Cubs and the Los Angeles Dodgers. This play Barbie doll is favored by many makeover doll artists because of the long, full hair and closed mouth Barbie mold. It is a relative bargain at eBay currently. This is one of several holiday themed Barbie dolls exclusive to Hallmark stores. Prices for this and all other dolls in the Modern Barbie Price Guide are for dolls NRFB (never removed from box). Dolls presented out of box will have a leseser value. Current Market Values: $30 for Scarlett; $35 for Rhett. These dolls were produced at the height of the 1990s Barbie doll collecting craze. These dolls were even part of an infomercial shown repeatedly on late-night television. Several versions of Barbie as Scarlett were produced; this version is Scarlett in the red gown. Ken as Rhett was only produced in the version pictured. The prices are for NRFB dolls. Delphine is a limited edition dressed Silkstone Barbie doll produced in 2000. The silkstone Barbie dolls, also called lingerie barbie dolls and part of the Barbie Fashion Model Collection are very popular with collectors. Silkstone is a patented type of vinyl which weighs, feels and looks like porcelain. This Southern Belle Barbie is from the Great Eras collection of dolls in which Barbie is dressed to represent various eras of history. This doll represents the 1850s in the Southern USA. Produced in 1997 Silken Flame Brunette Reproduction Barbie Doll. This is another of the mid-1990s reporduction Barbie dolls, produced before Mattel started presenting the reproductions in lift-off cardboard boxes. Silken Flame Barbie is available in Brunette or Blonde. 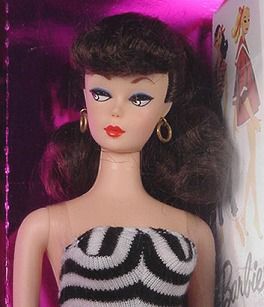 Solo in the Spotlight reproduction Barbie doll is one of the least favorite reproductions with collectors. Perhaps this is because of the somewhat garish pacakaging, or simply because so many of this particular doll was produced. In any event, it has not appreciated on the secondary market and can readily be found at eBay. This doll is available as a brunette or a blonde. Spanish Teacher Barbie is a Toys R Us Exclusive. Produced in 2000 Spanish Teacher Barbie in box. Coyright 2007 Denise Van Patten. Spanish Teacher Barbie is a multi-lingual, talking doll. Pink Inspriation Barbie doll was a special edition exclusively for Toys R Us. Produced in 1998, it is only available as an African American doll. This is a pink line (play line) doll and a wonderful example of a Barbie family doll with a great face mold and hair that can be purchased for a relatively inexpensive price. Doll uses the Asha mold. This doll originally retailed for $39.99 and is a relative baqgain in the collector's market. Modern Circle Barbie is from a short-lived but innovative series of Barbie dolls in which the characters were all involved in producing a movie called "Love in the City of Angels". Barbie is the producer of the movie and comes with her laptop, cell phone and briefcase. She is multi-jointed for easy posing. Additional characters were Ken as an art director with his portfolio and samples, Simone as a make-up artist with her make-up case and Melody as the production assistant with coffee, newspaper and movie magazines. These dolls are worth the price on today's market for the props alone. This Barbie is from the first year of the collection; in the second year of the collection, the dolls were dressed for a night out. You can pick up the Pretty Treasures Accessory Sets for very little on eBay, and if you are a collector that likes to set up vignettes with your dolls or likes to phootgraph your dolls, these sets can be invaluable. The accessories in these sets are made to scale. There are several Pretty Tresures sets including a Wedding set, a Picnic set and a Baking set. Mattel issued Millenium Princess Barbie and Millenium Princess Teresa at the end of 1999 to celebrate the turn of the century. Midge was introduced in 1963. She is presented here with a reproduction of vintage Barbie outfit #860, Senior Prom. Current Market Value: $50 to $75. This doll is the 9th of the original Bob Mackie Barbie doll series. These dolls have decreased greatly in value over the past five years due to their availability on eBay. Bob Mackie Barbie dolls are loved by collectors for the costume design and intricate detail of the costumes. Part of the I Can Be Series Barbie and Kelly Children's Doctor. This series of Barbie dolls was created to show girls that anything is possible. Doll was sold with an exam table and medical play piece. One of Kelly's legs kicks when tapped.